When a family struggles to come to grips with a older loved one diagnosed with dementia, the children are often kept in the dark. Why? In most cases it is because parents seek to protect their children, fearing too much information will cause them unnecessary stress. Efforts to block a child from a loved one’s illness, however, can backfire. Children are left to come to their own conclusions, which are often inaccurate. They can begin losing sleep, acting out, and feeling isolated from family and friends. 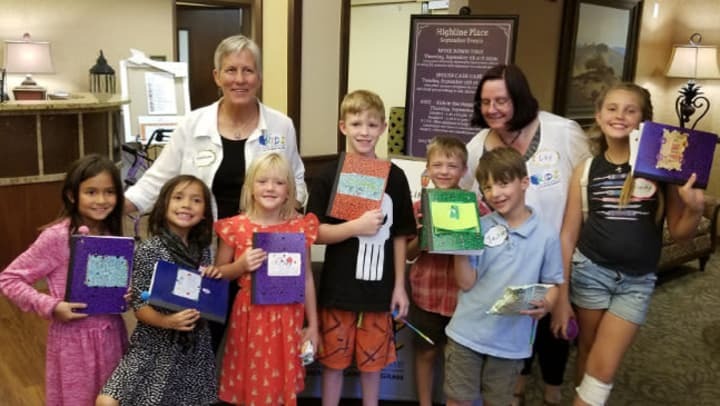 Highline Place Memory Care (an Anthem Memory Care community) in Littleton, Colorado, has created a unique program to help children understand and cope with dementia in their families. It’s called KIDZ, which stands for “Kids in the Dementia Zone”. The program consists of a series of sessions that, in a safe and nurturing environment, explain dementia in terms children can understand. It helps arm them with skills for coping with emotions and reactions to the disease. The program also promotes the use of “art journaling” therapy, in which the children use art as well as words to express themselves and how dementia impacts their lives and that of their families. The KIDZ program was developed to fill an important gap identified by Jodi Cornman, Community Relations Director for Highline Place, after meeting two young children whose father had dementia. While searching for educational resources for the youngsters, Jodi realized that few were available. That experience compelled her to partner with professionals and educators in the area to create KIDZ. The KIDZ sessions are directed by Lexanne Leonard, a teacher in the Cherry Creek School District; Kathleen Gorman, a spiritual care coordinator, and Jill Rocha, a quality improvement coach for Denver’s Early Childhood Council. You can find out more about KIDZ by contacting Jodi Cornman at 720-466-9442.